Newman's Own Organic Coffee - Special Decaf - K-Cups. A hearty full-bodied decaf. Bold, yet refined. Strong, yet smooth. Each box contains 24 single serve K-Cups. 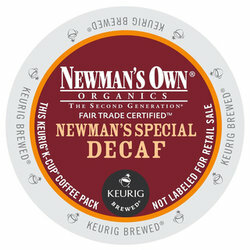 Newman's Own Organic Coffee - Special Decaf - K-Cups.